South Korea would have to spend W43 trillion to modernize North Korea's decrepit railway network, according to data from the Korea Rail Network Authority (US$1=W1,110). Last Thursday, the government ratified a set of agreements between the leaders of the two Koreas and estimated the cost of re-connecting the inter-Korean railways and upgrading the North's railroads at just W295.1 billion for next year. But as long ago as 2008, the Unification Ministry said that it would cost around W8 trillion to upgrade and repair North Korea's outdated railways, and by now the real cost is thought to be much higher. According to the KRNA, the government estimates it will cost W35.5 billion to build one kilometer of railroad, not including land purchase. Even supposing North Korea provides the workers at no cost, it would cost W13.2 trillion to modernize the 412 km Kaesong-Sinuiju line and W25 trillion to modernize the 781 km Kosong-Tumen River line. Labor costs typically account for only 10 percent of total railroad construction costs. 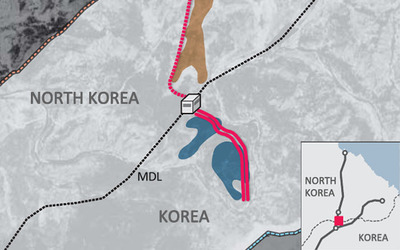 According to the Ministry of Land, Infrastructure and Transport's own estimates, it would cost W4.3 trillion to modernize the 161 km Kaesong-Pyongyang line and W1.5 trillion to modernize the 100 km Kosong-Wonsan line, again excluding land purchase and labor costs. Adding an estimated W5.5 trillion to modernize North Korea's roads, that brings the total to W43 trillion, a whopping 150 times the amount the government expects to spend next year. North Korea's landscape is more rugged than South Korea's, so a lot of money would go into building bridges and tunnels. High-speed railways would add an additional W10 billion per kilometer in costs. 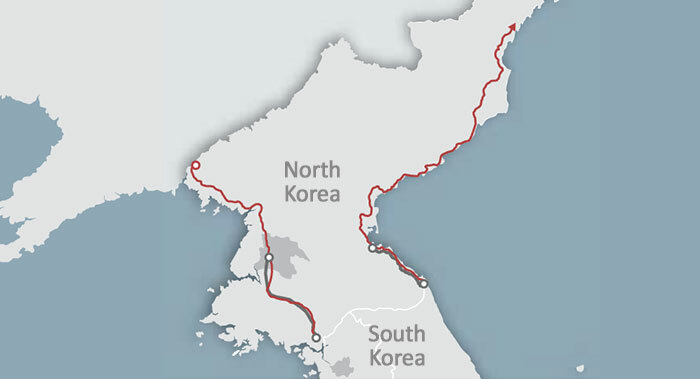 The estimate does not yet include the cost of reconnecting the Gangneung-Jejin line on the eastern coast. Liberty Korea Party lawmaker Cheong Yang-seog, who revealed the figures, said, "Modernizing North Korea's railway network is an investment in reunification, but the government is violating the National Assembly's authority to review fiscal spending by sidestepping the basis for cost calculation."